At Kelcher Optometrists we take your eye health very seriously so we have invested in the world’s leading retinal imaging technology; the Optomap. With traditional small-field retinal imaging only 10-45⁰ of the retina can be captured in a single image. 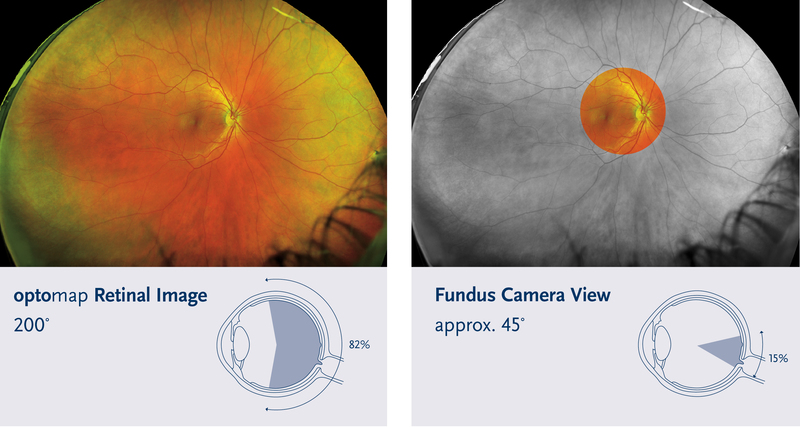 Optomap provides the only true ultra-widefield retinal image than can capture 82% or 200⁰ of the retina. Optomap offers unparalleled views of the retina which will provide our optometrists with the ability to potentially detect eye diseases more effectively and efficiently than with traditional eye exams. Early detection means successful treatments can be administered and reduces the risk to your sight and health. We are still using 3D OCT technology to capture high resolution images of the structural layers of the back of the eye. By using the most up-to-date technologies we can ensure the best eye care possible. We are recommending an enhanced eye examination which includes Optomap to all our patients and ultimate eye examination which includes Optomap and 3D OCT if advised by your optometrist.